US-Thailand Relations and Cobra Gold 2015: What’s Really Going On? Strained ties cloud specifics days before the Asia-Pacific’s largest annual military exercise. As Cobra Gold – the Asia-Pacific’s largest annual multinational military exercise – is set to commence on February 9 in Thailand, uncertainty continues to cloud specifics amid strained relations between Bangkok and its ally the United States. In over 30 years, Cobra Gold, which began as a bilateral drill between the United States and Thailand – Washington’s oldest ally in Asia – has now grown into one of the world’s largest multinational exercises involving some 30 countries. Last year, more than 13,000 servicemembers from the United States, Thailand, Japan, Indonesia, Malaysia, Singapore and South Korea participated, with China taking part in humanitarian projects and other nations including Myanmar sending observers. This year’s Cobra Gold, however, has been mired in controversy. A May 22 coup in Thailand led by General Prayuth Chan-o-cha forced the United States to suspend aid and cancel some exercises and exchanges. After much deliberation, Washington also decided in October to scale down Cobra Gold in 2015 but still keep it going. In doing so, the Obama administration sought to both signal its disapproval with the coup while also preserving a critical engagement that is not only a crucial part of its relationship with the Thai government and the Thai people, but builds trust between the regions militaries and demonstrates Washington’s commitment to the Asia-Pacific. But with the exercises due to begin in a few days, the optics between the two allies don’t look too pretty. U.S.-Thailand relations have deteriorated over the past few weeks, with the top U.S. envoy for East Asia Daniel Russel’s rebuke of the ruling junta in a speech in Bangkok on January 26 provoking a backlash (The Diplomat covered this here). U.S charge d’affaires Patrick Murphy was summoned to the Thai foreign ministry soon after, while a few others who had spoken out at home were also called in for a dressing down. On February 2, a joint press meeting between the United States and Thailand involving Murphy – which would have disclosed more details about the exercises – was reportedly canceled abruptly. No reason was initially given, but Thai supreme commander Worapong Sanganetra later said quite frankly that there was fear that political questions would be raised. Unveiling specifics about the Cobra Gold has proven to be an uncomfortable exercise for the junta, as it gets to the heart of the legitimacy of its rule in the eyes of the United States and the international community more generally. As for the exercises themselves, both sides have insisted they will continue as scheduled beginning February 9. Details, however, are still lacking for those looking for them. On the U.S. side, it is still unclear what a “refocused and scaled down” exercise – as the U.S. embassy in Bangkok put it rather politely in a statement last year – would look like. In an interview with a Thai broadcaster on January 26, Russel repeated that familiar refrain and noted that the focus would be on what the embassy had called “non-lethal activities” like humanitarian assistance and disaster relief. On the Thai side, some information has been released but full disclosure is hampered partly by the junta’s unwillingness to acknowledge that the exercise is indeed scaled down as well as apparent posturing. For instance, The Bangkok Post reported that Worapong, the commander, had said that U.S. troop numbers would be reduced this year from 5,000 to 4,000, but had strangely attributed this wholly to the fact that a U.S. navy ship has run aground in Japan. 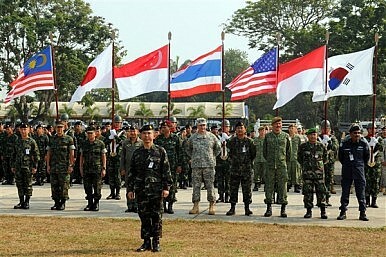 Nevertheless, a military source did confirm that all in all, about 4,000 U.S. soldiers, 4,000 Thai soldiers, and 10,000 from other nations are expected to participate in the two-week exercise, and that the exercises would involve the participation of seven countries, namely Thailand, the United States, South Korea, Japan, Indonesia, Singapore and Malaysia. Another uncertainty is the exact nature of China’s participation in Cobra Gold this year. That same military source in the report also said that Chinese soldiers would take part in “humanitarian civic action training.” The Bangkok Post had also previously cited a military source on February 2 as saying that China would participate in the exercises for the first time, but that it would not take part “in the combat side” and “instead will focus on humanitarian operations”. If that is so, it is not evident how Beijing’s participation would differ from last year and, consequently, why its involvement is so unprecedented. In 2014, Beijing had participated in Cobra Gold for the first time and its role was also limited to the humanitarian portion, including providing engineering support and medical aid. What we do know is that China’s defense minister Chang Wanquan along with representatives from each of the three armed services are scheduled to meet Thai leaders this weekend before Cobra Gold begins, and that the two sides will discuss potential military cooperation. The significance – both symbolic and potentially substantive – was not lost on those keeping score between the U.S. and China in Southeast Asia. These uncertainties aside, should Cobra Gold proceed as planned, the United States and Thailand would have navigated past a rough patch in their relationship and carried on with an exercise that is not only a critical part of their bilateral ties, but regional security more generally. As those involved either directly in the exercise or planning it know well, it is exactly these kinds of ritualized multinational engagements that allow militaries in the Asia-Pacific to prepare for cooperative endeavors when disaster strikes, be it a tsunami, a typhoon or a plane crash. But looking further out, with elections looking unlikely in Thailand in 2015 (see The Diplomat’s report here), it remains to be seen how Washington will handle Cobra Gold 2016 if the junta is still in power and little progress is made towards restoring democracy. Junta leader defiantly rebuts criticism directed against his administration. Thailand's Junta in Campaign to Mend US Ties Did China Just Boost Military Ties with Thailand?Strengthening the US-Thailand Alliance for an Indo-Pacific FutureUS-Thailand Anti-Submarine Warfare Exercise Kicks off in Andaman SeaOldest US Ally in Asia: Thailand or the Philippines?